I had seen this rumoured, but SEGA has now confirmed that Hatsune Miku's other upcoming PlayStation 4 game, Future Tone, is so big that it's being split into two separate releases, and together they'll total a whopping 220 music tracks. To put that in context I count roughly 150 or so across the current trio of Miku games on handheld consoles; Project Diva f and f 2nd on the PlayStation Vita, and Mirai on the 3DS, and between those three games I've gone past 1000 hours of play time now. So I can only imagine how much more time this new game will occupy. Related reading: Last year Matt realised the dream and went to a Miku concert. His full report here. The break down of the two "versions" of Future Tone will work like so: Miku: Project Diva Future Tone – Future Sound features songs from the Project Diva series. 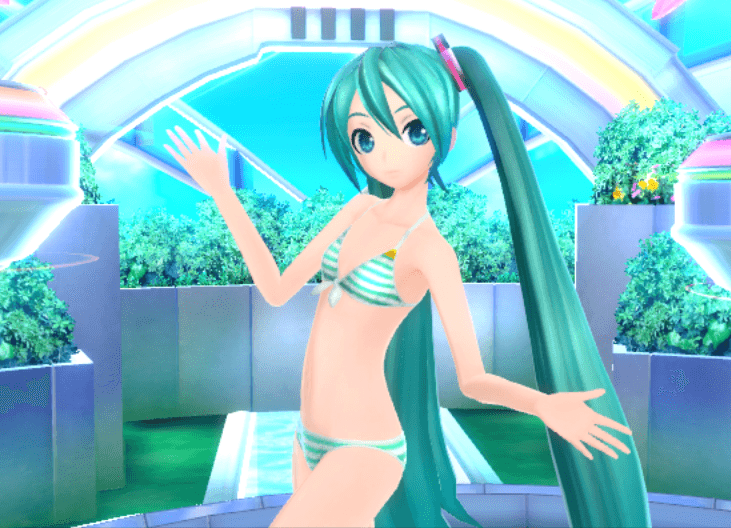 Hatsune Miku: Project Diva Future Tone – Colorful Tone, meanwhile, takes its tracks taken from the Arcade version, as well as Project Mirai on 3DS. Oh, and the game will run at 1080p, 60 frames per second, and feature 340 different costumes for Miku and her friends. But being honest here, between my PlayStation Share button, Miku's one piece swimsuit, and my Twitter account, I've got about 1000 hours more spam... uh, gameplay, right there. Both editions of the game land at some point this year. No announcement of an English release yet. I'm going to riot if SEGA doesn't get on that quicksmart.